Round 1 of the 2018 NB Senior Men’s & Mid Master Championship Presented by Audi Moncton began with the Mid-Masters leading off the field. Players at the front of the field were greeted with a humid and damp morning as they set out to try and conquer the difficult Royal Oaks course. As the day moved on, the wind began to pick up and take its toll on the leaderboard as high scores became more and more common as the day aged. Leading the charge in the Mid-Master Division is Cameron King of Brudenell River. Cameron recorded an opening round 3-under par 69 to put himself on top of the Mid-Master leaderboard and secure the low round of the day. King’s round consisted of 13 pars, 4 birdies and a bogey which lead to a front nine 3-under par 33 and an even par back nine of 36. 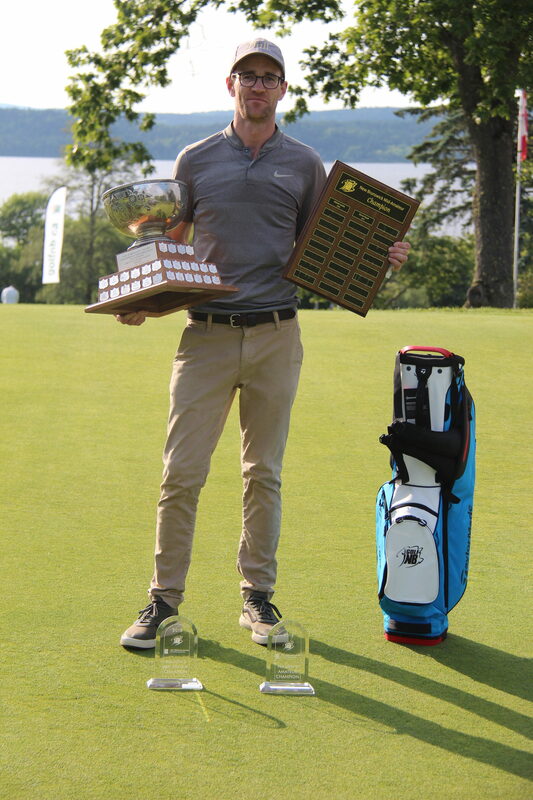 Cameron will enter the second round with a two-shot advantage over 2015, 2016 and 2017 NB Men’s Mid-Master Champion Edward Reevey of The Riverside. Sitting in second place, Reevey signed for a 1-under par 71 during his morning round which was comprised of 13 pars, 3 birdies and 2 bogeys. 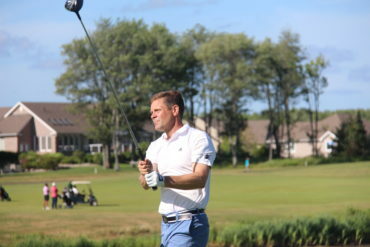 In a three-way tie for third place is Fredericton’s Bob Brown, Lakeside’s Remi Comeau, and Brian Dalrymple of Kingswood who all sit at 2-over par after a first round 74. In the Senior & Super-Senior Division, the field was faced with an uphill battle trying to go low against the moist fairways of Royal Oaks combined with a links like wind that carried through all 18 holes. After the first round, the leaderboard contains a three-way tie for first place between Ralph Michaud of Aroostook Valley, Mike Breen of Hampton and Denis Beaulieu of St. Quentin. The three all recorded first round even-par 72’s which any golfer would be happy to card in today’s conditions as they all exchanged birdies and bogeys throughout the round. 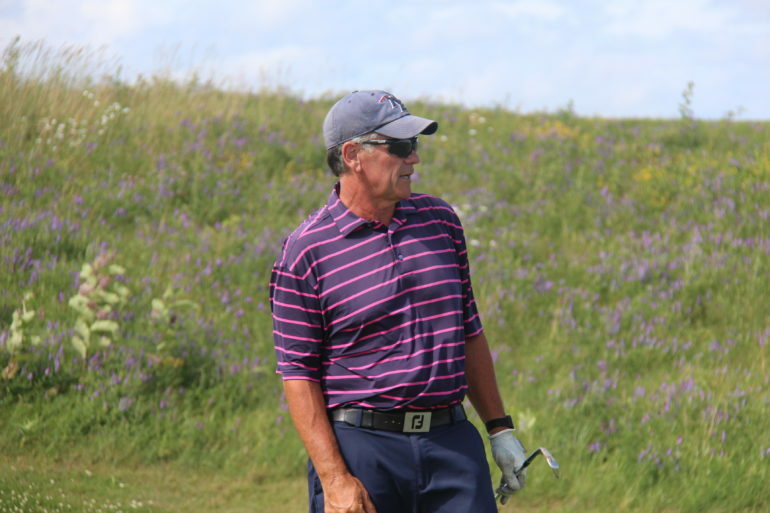 In a tie for fourth place in the Senior & Super-Senior Division is The Riverside’s Mark Armstrong, Fernand Robichaud of Pokemouche, Jean LeBlanc of Fox Creek and Michel Power of Memramcook who all sit at 1-over par 73. 2017 NB Senior Champion Wilf Pilgrim of Kingswood currently sits 9 shots off the lead after recording a 9-over par 81. 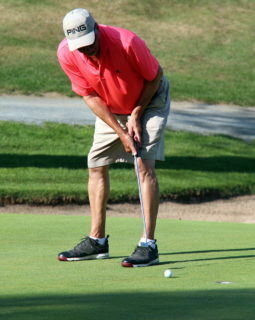 Herrick Hansen of Aroostook, 2017 Super-Senior Champion recorded a 3-over par 75 which puts him 3 strokes behind leaders Breen, Michaud and Beaulieu. The top three finishers in the NB Senior Men’s Championship will earn the opportunity to represent New Brunswick at the Canadian Senior Men’s Championship to be held from September 4th to 7th, 2018 at Gowan Brae Golf & Country Club in Bathurst, NB.